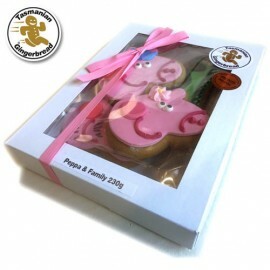 Peppa Pig and Friends Gift Box - Original Recipe in Windowed Gift Box. Filled with brightly iced Peppa Pig gingerbread shapes. Icing contains: Sugar, Corn Syrup, Water, Palm Oil, Gum Tragcanth, Glycerine, Vanilla Flavouring, Corn Starch, Cellulouse Gum, Titanium dioxide, Potassium Sorbate, Acetic Acid, Colours 150D, 127, 103, 129, 110.